Meet our very sweet and very handsome, Operation LBD’s Cole. 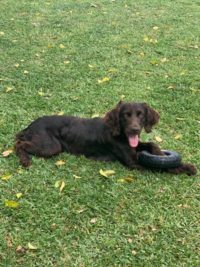 Cole is an approximately 9 month old purebred, male, Boykin Spaniel. He is utd on vaccines, neutered, heartworm negative, microchipped and a very sweet little guy! Cole was surrendered to Operation LBD for his destroykin tendencies. However, since coming in to us, his foster mom says he hasn’t torn up anything at their house…he needs a job and plenty of activity to keep him engaged and busy. He absolute loves his foster fur siblings and another dog for him to hang out with will be a must for Cole. He sleep in a crate and will go in with a treat and is content inside the crate. He is a very loving and gentle puppy with lots of energy. His foster family is working on some commands like sit, stay and here and he he’s doing well but like most Boykins, he is hard-headed at times. He will sit and take treats from your hand gently. Basic training will need to continue for Cole, with his forever family. He is almost 100% house trained and has only had a couple of minor accidents since being with his foster family. We’re happy to say that he does not counter surf nor beg at the table and he walks on the leash without pulling. He loves to run and chase birds and sometimes run just to be running kinda like Forrest Gump! He also loves, loves, loves to ride on the golf cart or ATV. Cole’s forever family needs acreage for him to run, fur siblings to play with and something to ride on. He is still a puppy with lots of energy! If you are interested in adopting our Cole and can meet the needs mentioned above, please click here and complete an adoption application and mention Mr. Cole. Thank you! Meet our very sweet and very handsome, Operation LBD’s Jake. 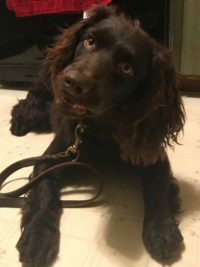 Jake is an approximately 1.5 year old purebred, male, Boykin Spaniel. Jake is utd on vaccines, neutered, heartworm negative, microchipped and a very sweet little guy! He loves being with his foster family and his foster fur-siblings! He is great with other dogs and older, dog savvy children. He is a jumper, so younger children or elderly people would not be the best fit for Jake, as he’s trying to play and love on his people but will knock them down, from excitement. He is crate trained and does well once he is in the crate but getting in to the crate, he needs some coaxing and treats to entice him. He lived outside before joining Operation LBD and his foster parents are working with him on house training and he’s doing excellent! He is a puppy still and he does have the “destroykin” gene in him so his new family will need to pay close attention to him to ensure he doesn’t get himself in to trouble. Jake craves attention and loves his people! His foster family can’t say enough about what a loving, happy boy he is! His new family will not only need to give him lots of love and attention but since he’s still in “that puppy phase”, need to continue working on his manners and basic training skills. If you are interested in adopting our Jake and can meet the needs mentioned above, please click here and complete an adoption application and mention Mr. Jake. Thank you! Operation LBD’s Demi has a wonderful adoption pending and we couldn’t be happier for her! She has found her special family and is going to have an amazing life! 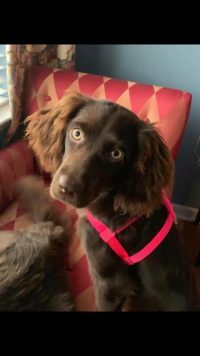 Demi is an approximately 9 month old purebred, female Boykin Spaniel. Thank you! OLBD Beau is an approximately 8 year old purebred, male, Boykin Spaniel. Shortly after intake in to Operation LBD, Beau was diagnosed with heartworms. Operation LBD and his fosters will see him through his treatment and get him healthy! Prayers would be welcome for this sweet boy during his treatment. We are very happy to say that Beau’s foster parents have agreed to “foster-to-adopt” our sweet Beau when he is cleared from his heartworm treatment! We couldn’t be happier for this precious one! Thank you! 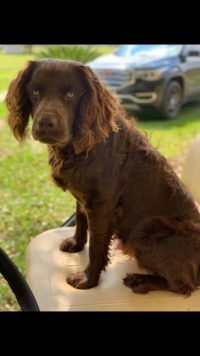 OLBD Gauge is a 9 month old male, purebred Boykin Spaniel. Gauge is currently in foster care and will remain in foster care until he is old enough to be neutered by Operation LBD standards. Gauge’s foster family is deeply committed to him and his care and have fallen in love with our little guy! He has two human siblings that he adores and adore him. He’s one lucky little Boykin and will be adopted by his foster family once has recovered from his neuter surgery! Thank you! If you are interested in adopting one of our wonderful dogs, shown above, please click here to go to be redirected to our Adoption Application. Please be sure if you are interested in apply for a particular dog, that you state that dog’s name in the comments section. Thank you!